but I suspect an in-depth analysis of the people in old photographs, and their lives (family, friends and place in micro-history) may not be. 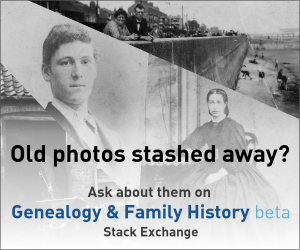 The Genealogy & Family History SE (G&FH SE; which is still in Beta, and where I am a pro tem moderator) often uncovers old photographs, and its users are very interested in the people in those photos. Researching them often involves learning about the photographers and their studios which brings G&FH SE users here. That site would love to help Photography SE users with researching the lives of the people in their old photos. I think there is much potential synergy between Photography SE and G&FH SE and, if you agree, do you think its posting of a Community Ad candidate (that still requires two votes, before it can start to appear), is the best way to try and promote awareness of what can be gleaned from people in old photos, by their owners posting questions to G&FH SE? I don't think we're interested in identifying non-notable individuals in photographs (or even famous individuals in random non-notable photographs). As you put it, micro-history isn't really the intention. However, we might be able to help with the technical and artistic context, or possibly help place a photograph in time based on the process and technology used. Using concrete examples from the other site, I think In 1963 were photos dated when processed or when taken? would be welcome, while Identifying person in two 19th century photos (one from Hannover)? would not. And, honestly, I don't know what site consensus might be on When might this photograph have been taken and why? — I'd want it to have a much more specific title, but other than that, I find it interesting. For me at least, the background test for topicality is whether question might help me or others in practicing or enjoying photography as a hobby (or profession). Questions about how the art and science have progressed through over time, and how society has reacted to and perceived photography in different times and places can help inform how we think about photography today. Questions about "who was this guy"? (or What is this watch model?) probably don't. In the photographic community in general there is a significant subgroup interested in traditional (silver based) photography and related techniques. This subgenre is more active on other sites (e.g. APUG.org) but historical techniques and related themes - such as archival stability of cyanotypes or albumen prints - should be on topic here. The emphasis here is on how historical images were made, rather than on who made them and of whom they were made. When we are interested in historical persons it is because they made a contribution to advancing the practice of photography in some way that is significant, not because they photographed historical events using the same mundane photographic techniques everyone else was using at that time. That's not to say we are not interested in what those accepted practices were in a given era, it's just that we aren't particularly interested in identifying which run-of-the-mill photographer in 1917 was practicing in Philadelphia and which other one didn't open a Philadelphia studio until 1919. Should questions about model releases/permissions/commercial use be off topic? Where and how to post RAWs while removing identifying data?